Q: Should there be a reply to my questions/order? Q: Do you assemble flatpack items other than Ikea? A: Yes. 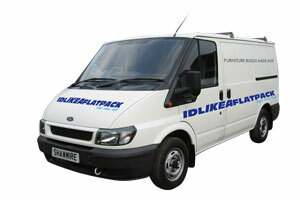 We can assemble any flatpack items. Q: Can you collect items from anywhere other than Ikea? A: Yes, from anywhere that has a distribution depot and will accept third party collection. Please contact us for a quote. Q: Do you collect and deliver items to ports for shipping to islands? A: Yes. We can collect and deliver to any port for further shipping. Please e-mail with details for a quote. Q: Can you deliver to France? A: We look for the cheapest ferry crossing, usually Poole, into Northern France to deliver. Quotes on this may vary due to seasonal ferry prices. But yes, we can deliver to France. Q: Do you know anyone outside of your area?